When you have a child with special needs there is always that why did this happen question in the back of your mind. Always wondering what you could have done differently. I've heard as time goes on it gets easier to focus on the now instead of the past. I think this is true. It's become easier for me, but every now and then the what ifs come out of no where. Yesterday, I stumbled across an article on Gastroschisis. I don't typically go out searching for information on Gastroschisis anymore. Caleigh isn't the typical Gastro case. I even stopped reading the Gastroschisis Yahoo Group about a year ago. I had downloaded a really nice medical news app for my phone and I was skimming through the Gastroenterology section when I found the article. It is a fairly new study about a cluster of Gastroschisis cases in Washoe County Nevada during the period April 2007 – April 2008. Caleigh was born during that time period. I've always been told that Gastroschisis comes in clusters. When Caleigh was born there were 3 other Gastro kids in the NICU, but at times there weren't any for months. Even our surgeon who had been doing Gastro repairs since 1976 stated the same. 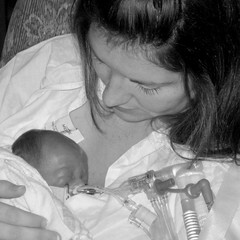 When Caleigh was born, just like the previous 30 years, no one knew what causes Gastroschisis. Of course, I've read snippets of information. Possible restricted blood flow being one of them, but nothing concrete. When we went to the genetic doctor she said it was a fluke occurrence. The favorite among causes is the term Environmental. Which basically means: We Don't Know. Nice, huh? So when I was reading the new article, my heart sunk. Here's the paragraph that really got me. "In this study, “case mothers,” mothers who had babies with gastroschisis during the study period, were 13 times more likely to report having a sore throat during early pregnancy, and 17 times more likely to report having a chest cold in early pregnancy than “control-group mothers,” those who did not have babies with gastroschisis during the study period. In addition, case mothers were nine times more likely than control-group mothers to report having taken over-the-counter medications for these infections during pregnancy." I was 5 weeks pregnant with Caleigh when I got the flu. Sore Throat..Check. Chest Cold...Check. Over The Counter Medications........Check. When I got the flu I went to our primary doctor. He told me to take Tylenol and Sudafed (pseudoephedrine) as directed. I was ok with the Tylenol. When you get pregnant that's the only thing your allowed to take. The Sudafed I wasn't ok with. I went home and called my OBGYN to ask her if it was ok. She said it was fine. Two opinions, two doctors. I ended up taking Tylenol during the two weeks of flu, but sparingly. I took Sudafed twice during that time because I was coughing so hard I couldn't sleep. "This study added significant support to the findings of other studies that certain infections, such as colds and sore throats; use of cold medications, such as pseudoephedrine; and some recreational drugs, may be contributing factors in the development of gastroschisis." So today I feel responsible. I feel misguided. It makes me sick to my stomach. Two weeks can change SO much. I may never know what exactly caused Caleigh's birth defect, but the questions will always be in the back of my mind. The what ifs are heavy today.